Everyone wants a beautiful smile. We all want to have the confidence a beautiful smile helps us achieve. However, some of us struggle with that confidence and hide our smiles because they’re flawed. Have you heard of porcelain veneers? The goal of this article is to explain this procedure that can give you the smile you’ve always dreamed of. And it will also explain two different types of porcelain veneers, including dental Lumineers. Originally popularized in the 1980s, porcelain veneers have been used for many years and have been considered by a large number of dentists to be one of the most effective ways to create a seeming flawless smile for their patients. However in recent years, dentistry has undergone significant changes thanks to advancements in technology that have in many ways revolutionized the profession. Porcelain veneers, called Dental Lumineers, are one of the numerous advancements to come out of this dental revolution, and since their inception, have certainly given the traditional veneers a run for their money. Porcelain veneers… What are they? As mentioned previously, due to their ability to create a picture perfect smile, porcelain veneers have been a powerful ally for not only dentists but for actors and models too! Porcelain veneers are a thin, shell like device that are designed to be fitted directly over your teeth; protecting your teeth from outside elements, while simultaneously covering up any gaps, cracks, or chips in your teeth. While this aspect has made the porcelain veneers a popular and sought after procedure within the realm of cosmetic dentistry, the process of getting these small porcelain devices present a few issues as well. Porcelain Veneers… What is the process? To receive your porcelain veneers, your dentist will be required to make a certain amount of alterations to your teeth, including the shaving down and reshaping of some of your teeth, as well as the removal of the enamel of your teeth. Although these procedures are all relatively minor, the alterations of ones teeth can potentially result in long-term dental issues, particularly if the procedures are performed on young or healthy teeth, in which porcelain veneers would not be needed. A New Era for Porcelain Veneers! Although dental Lumineers have been around for quite a few years, due to modern advancements in technology, dental Lumineers are now available to a much wider audience, and have been improving the smiles of people nationwide. While much like the porcelain veneers, dental Lumineers are thin porcelain devices that encase your teeth like a protective shell. Lumineers are much thinner and have a clearer appearance. However what makes Lumineers truly unique is the fact that they do not require any reshaping or alterations to your teeth; that means no drilling and no pain. In addition to leaving your enamel completely intact, it ends up being a much less invasive procedure. Ultimately this is a much more desirable experience for the patient. This quick and painless process requires only two simple appointments, and the resulting set of dental Lumineers, if maintained properly, can last decades. Watch these stories, captured by video, featuring people of all ages who have gotten dental Lumineers. Click here, if you are interested in seeing Before and After photos of actual dental Lumineers patients? If you want Dental Lumineers… Talk to your dentist! 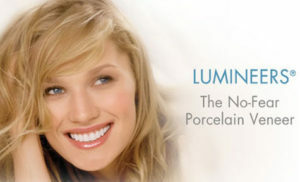 Many dentists consider the increasingly popular Lumineers to be a superior product to classic porcelain veneers; however, if you have questions about either or are curious if one might be right for you, consult your dentist and ask if they feel dental Lumineers or porcelain veneers would right for you. If you are interested in learning more about porcelain veneers or dental Lumineers, schedule a free consultation with Dr. Charles R. Kimes at Overland Park Dentistry. As a Lumineers dentist, Dr. Kimes will help you explore your options for a personalized Hollywood smile, so you can make and educated decision to whether dental veneers or dental Lumineers is the best option for you. Our south office can be reached at (913) 647-8700 and our north office at (913) 341-2380. We look forward to meeting you.